Welcome. 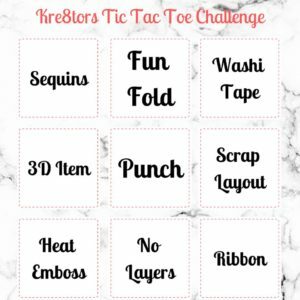 Today I am taking part in the Kre8tors Blog Hop where the theme for this blog hop is Tic Tac Toe or Noughts and Crosses. With Tic Tac Toe we are asked to choose a line of 3 for our project. I decided to use Washi Tape, Scrap Layout and Ribbon. For the months of January, February and March every year, Stampin’ Up! hold a fantastic promotion. Here in the UK for every £45.00 spent on products you can choose a FREE project from their Sale-A-Bration catalogue. There are even a couple for you to choose if you spend £90.00! In this year’s SAB catalogue we have the Botanical Butterfly DSP. And as everyone knows I love Butterflies so I am a very happy person. Once I had finally managed to stop ‘stroking’ the DSP and I then started cutting it up. I decided that as I had already purchased Pick A Pattern Washi Tape I would make a black and white scrap layout. 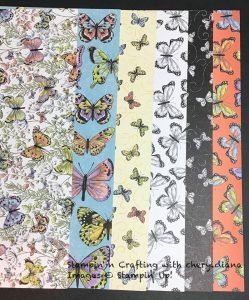 I wanted to use the black and white DSP from the Botanical Butterfly. For the ribbon I chose to use 5/8″ Polka Dot Tulle ribbon. 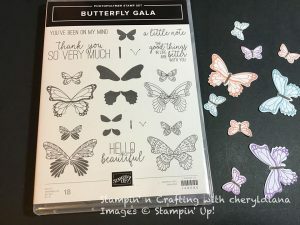 I stamped one of the small butterflies from Butterfly Gala using Black Memento Ink over the whisper white 12×12″ card stock. Yes I did cut the stamp so it was easier to stamp the small butterfly. Along the left hand edge I stuck a piece of Basic Black card stock and stuck the ribbon down the middle using glue dots. 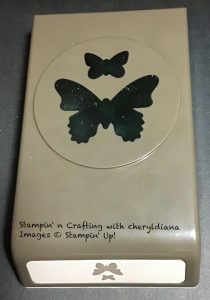 The butterflies were punched out of another piece of scrap DSP using the Butterfly Duo punch and stuck down. I added Clear Rhinestones to the bodies of the butterflies. 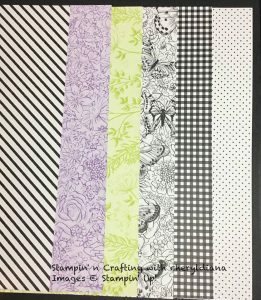 2 pieces of scrap DSP were stuck to the middle of the page and edged with the Pick A Pattern washi tape. Finally I cut 2 pieces of Basic Black card stock and Whisper White card stock and stuck them down for future photos. I hope you have enjoyed my samples. Please do leave comments as you Hop around. Please click on the next button to see the lovely Dorothee and what she has made. I really love your layout! TFS! It’s a beautiful lay out! I love your layout. I feel so intimidated by scrapbook. The page is too big for me. You used it beautifully. That DSP is fantastic, isn’t it? I was stroking it first as well. Love the Black & White designs, lovely page. Lovely scrapbook page! Great combination of products! Beautiful! Love the black & white side of that paper… which I haven’t used until now. I’m inspired! 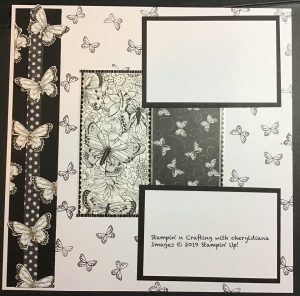 Cheryl, I really enjoyed this scrapbook layout! I love seeing these and it inspires me to get mine started! You used the products so beautifully. Thank you so much for sharing your creativity with us and hopping in this challenge!